We will not share your personal information (name, address, phone) with anyone for any reason unless compelled to do so by law. Your information is only used to process your order and communicate with you. We operate a secure site for our shopping cart and account management, using encrypted transactions for all your credit card and personal information. When you see “https” instead of “http” in your browser’s address bar when checking out, the data is encrypted as it is passed between your computer and our servers. This prevents outsiders from obtaining personal data or credit card information. Our order processing software automatically sends out an order confirmation email when an order is received. A ship confirmation email is sent (if the order is shipped via UPS) at the end of the day when the order is shipped. These emails are automatic and are sent by our server software. If you have spam-blocking software, you may not be able to receive the emails. If you do not receive an order confirmation email or a ship confirmation email, you can check the status of your order by clicking on My Account in the upper right corner on our website. We will not share your email address with third parties unless compelled to do so by law. If you wish to receive our weekly email newsletters, which include special offers and information about new products, you can join our email list. You join this list when you create your account the first time you order, but every email we send includes a ‘one click unsubscribe’ link so that you can easily opt-out of all future emails if you wish. SleepDirect accepts no responsibility for the proper use of the products purchased and makes no warranty, either expressed or implied, as to fitness or applicability of the products we sell for any particular use. - Sleep Direct is legally prohibited from accepting prescriptions from a foreign physician. 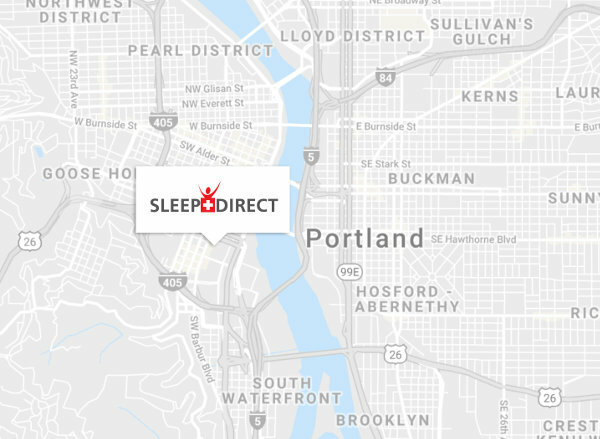 - All services provided, including the advertisement, ordering, sale, delivery, instruction, and set up of the products, are performed solely by sleepdirect.com and independent of the manufacturer. Sleep Direct is required by law to protect the privacy of your medical information and to provide you with written notice describing our legal duties and privacy practices with respect to protected health information. SLEEP DIRECT may use or disclose to others your medical information without your authorization for purposes of providing or arranging for your health care, the payment for or reimbursement of the care SLEEP DIRECT provides to you, and the related administrative activities supporting your treatment. For example, Sleep Direct may disclose your medical information to other healthcare providers involved in your care, to insurance companies as necessary, and for internal purposes such as training or quality improvement. SLEEP DIRECT may be required or permitted by certain laws, regulations, or in case of an emergency to use and disclose your medical information for certain purposes without your authorization. Other disclosures permitted or required by law include the following: disclosures for public health activities; health oversight activities including disclosures to state or federal agencies authorized to access protected health information; disclosures to judicial and law enforcement officials in response to a court order or other lawful process; disclosures for workers’ compensation claims, disclosures to military or national security agencies, coroners, medical examiners, and correctional institutions as authorized by law, and to other healthcare providers as necessary for your treatment, or their payment or healthcare operations. Uses and disclosures other than those described in this policy will only be made with your written authorization (that you may later revoke). SLEEP DIRECT may contact you to give you information about treatment alternatives or other health-related benefits and services that may be of interest to you. As our patient, you have the right to inspect and copy your medical information we maintain, amend or correct that information, obtain an accounting of SLEEP DIRECT disclosures of your medical information, requesting SLEEP DIRECT communicates with you confidentially, request SLEEP DIRECT communicate with you confidentially or by an alternative method and complain if you think your rights have been violated. You also have the right to request that SLEEP DIRECT restrict certain uses and disclosures of your health information (including, but not limited to, disclosures related to treatment, payment or healthcare operations and limited disclosures to family members and others responsible for your care). SLEEP DIRECT will endeavor to adhere to these restrictions but is not required to agree to any such restrictions. SLEEP DIRECT will follow these privacy practices described in the Patient Health Information Policy. SLEEP DIRECT reserves the right to modify the terms of this Patient Health Information Policy and will make the new terms applicable for all protected health information we maintain. If we change this Patient Health Information Policy we will post the revised policy on this website and it will be available upon request. The effective date of the current policy: November 14, 2011. You have the right to receive a copy of SLEEP DIRECT’s most current Patient Health Information Policy. To request a paper copy of the latest policy, contact Sleep Direct, 900 SW Fifth Ave., #1825 Portland, OR 97204. If you have questions, concerns, or complaints about the policy or your medical information, please contact the Sleep Direct Privacy Officer at sales@sleepdirect.com, or via phone at 1-800-506-6904. You may also file a written complaint with the Director, Office for Civil Rights of the U.S. Department of Health and Human Services. We will not retaliate against you if you file a complaint with the Director or with our office. Purchases of equipment on Sleepdirect.com may be submitted to non-Medicare insurance companies for reimbursement depending on the benefits provided by your insurance plan. Reimbursement is authorized at the discretion of each insurance provider and Sleepdirect.com does not in any way guarantee the reimbursement of purchases made on Sleepdirect.com. Purchases made on Sleepdirect.com cannot be submitted by a Medicare beneficiary to Medicare CMS or a Medicare division of an independent insurance company.